Fishing swivels are handy and sometimes a necessary accessory. Fishing swivels are designed to prevent line twisting caused by either the bait twirling in the water or a hooked fish attempting to twist free. This makes the swivel a must for many styles of fishing. Anglers who like to tie their own rigs also find the swivel handy for linking the leader to the line plus the swivel serves as a stop for sliding sinkers. A hand tied bottom fishing rig is a good example. There are basically three types of swivels that are relevant. The first of these is the barrel swivel. The barrel swivel is the most commonly used mainly because of the price. The barrel swivel works as designed to prevent line twist until stout tension created by pulling action of either a battling fish or the resistance of a hefty bait trolling in the water. This tension causes a friction which disables the swivels ability to turn freely until the tension is relieved. The crane swivel is the better choice for most fishing situation. Similar in design to the barrel and priced only slightly higher, the crane swivel out performs the barrel when under pulling tension. Catfish are notorious for twisting, thus it's a good idea to use fishing swivels on trotlines. The third type and most expensive are the ball bearing swivels. Mainly used for trolling bait or lures, they are highly recommended by off shore anglers because the internal built-in ball bearings allow the swivel to turn freely even under extreme pulling tension. With the barrel, crane, and ball bearing swivels being the main component, a variety of options exist such as the very commonly used snap swivel. A fastener or snap is attached to one end of the swivel this permits quick attachment (or change) of a hook, lure, or sinker. 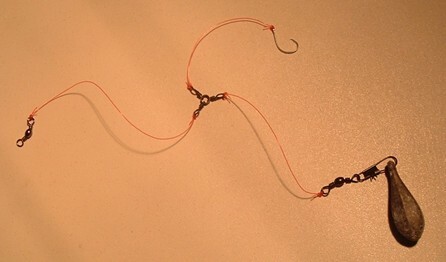 Many prefabricated leader rigs come with snap swivels for this reason. 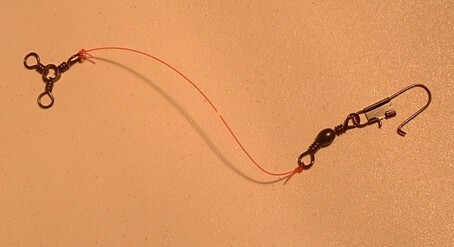 Many anglers who make their own leaders use the very versatile 3 way swivel. The 3 way allows for a sinker to be attached so the sinker can anchor the bottom of the rig while permitting the bait to be suspended above. 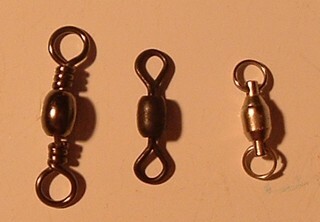 A combination of 3 way swivels are used to created the high-low rigs often seen on off shore reels. Tie the 3 way to the snap swivel. The snap swivel here will hold the sinker. Next tie the barrel swivel to the 3 way. The barrel will attach to the reel's fishing line. Add the hook and you're ready to fish. Here's a look at a hand tied high-low rig which can be used for surf fishing. In most cases when casting artificial lures fishing swivels are not recommended unless a particular lure has the tendency to twirl when retrieved. However, if you are fishing with a kid who like to change lures frequently the uses of a snap swivel allows for a quick change without having to re-tie each change. 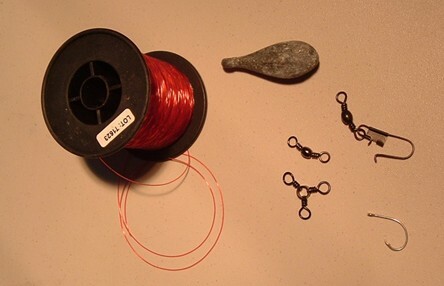 Also, fishing swivels are not usually needed when using live bait where twisting is not an issue for example, a cane pole baited with worms or crickets used to catch bream. Same goes for using a rod and reel while floating a shiner.